With majestic manes and powerful roars, hundreds of thousands of lions once ruled the plains of Africa. The African lion (Panthera leo) still roams portions of his native environment, but only a fraction of the original population remains. These big cats still fill an important ecological role as a dominant predator. All ecosystems exist on a foundation of feeder microorganisms and other small creatures, like bacteria and plankton. Alterations in the food chain at this lowest level can shock the entire system. However, lions and other predators that dominate the top of the local food chain are also vital to an ecosystem's health. 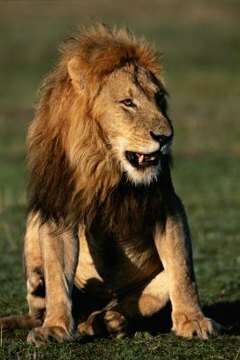 Lions are carnivores and have no natural predators besides man, which makes them apex predators or keystone species. They cull populations of herbivores and smaller carnivores through predation. Without lions, some creatures would overpopulate. Removing apex predators can be just as bad if not worse for an ecosystem than removing a building block species from the bottom of the food chain, according to the Yale University Environment 360 website. Lions have been depicted in works of art and written record for thousands of years. These regal cats are the "standard" lions known around the world with tan bodies and darker manes. Flags and banners of various historical and modern nations include images of these big cats. They are also the inspiration for corporate logos and other modern symbols. African lions are the only cats that hunt, travel and socialize as a group on a regular basis, according to Africa Travel Portal. This makes them interesting targets for animal behavior researchers. Groups of lions, called prides, contain one to three males and up to 10 females. While African lions have fared better than many other big cat species in other parts of the world, they have been in a steep decline for decades. Of the 100,000 or so lions that prowled the plains in the 1960s, only 32,000 remained as of 2012, according to National Geographic Cat Watch. Declines in lion population is almost entirely due to human development and expansion. As people migrate toward unpopulated areas, conflicts with the aggressive feline inhabitants are inevitable. While poaching contributes to the decline in population, many lions are killed by people defending themselves or their livestock. A few lions stalk prey across the African wilderness, but most of the remaining population is isolated in pockets rather than distributed evenly across the continent. The lion's population decline has already had noticeable impact on the ecosystem. Researched have recorded up-to-twofold increase in buffalo populations in areas with dwindling lion populations, according to Lion ALERT. Zebra populations have also increased in the absence of lions, which are one of their primary predators. As the population of large herbivores increases, the amount of available vegetation in those regions diminishes. This has severe implications for other plant-eating animals and insects.